ANNOUNCING THE LAUNCH OF Rabbi.com , a website that allows individuals with rabbinic needs to find, compare and connect with rabbi at the click of a button. Rabbi.com replaces the traditional, time-consuming, and frustrating process for individuals hiring rabbi with a centralized, efficient, and transparent online directory and referral process. Rabbi.com recognizes that one of the greatest challenges facing the Jewish community today is to develop long term educational strategies that will insure sustainable continuity of our heritage. Whatever your education goals, Rabbi.com has video lessons on a variety of subjects, a clearinghouse of free knowledge from some of the world’s most inspired Rabbinic thinkers. Smart thinkers explaining Torah in a way that everyone can understand. Providing an open platform for all denominations ordained Rabbis and Scholars to share Jewish principals, values, wisdom and insights. 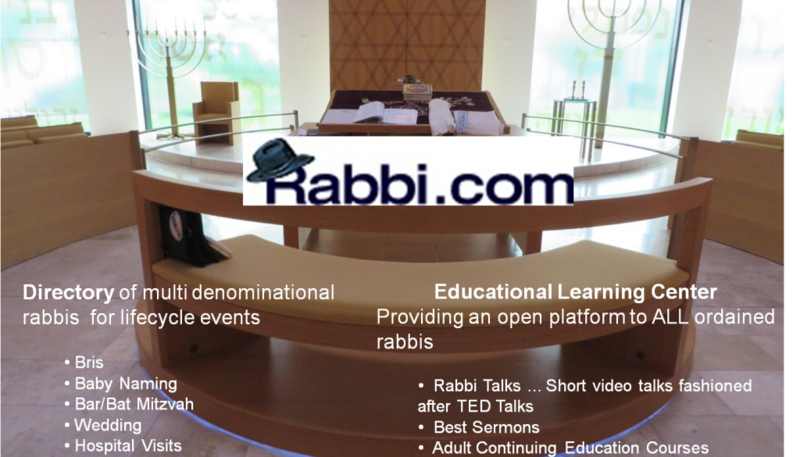 Rabbi Talks Inspired by TED style Talks, com Talks are devoted to spreading Torah insights, in the form of short, powerful talks (18 minutes or less) that covers all Torah topics — from science to business to global issues. Rabbi TALKS are engaging, positive, uplifting and inspiring videos. Adult Continuing Education Courses taught by teachers/rabbi who are experts and skilled at explaining complex topics in simple, easy to understand ways. Video lessons – difficult subjects explained with simple, bite-sized lessons. 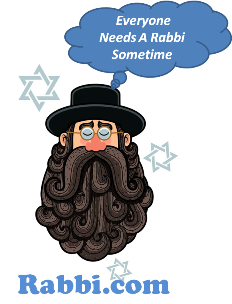 Rabbi.com revolutionizes the process for hiring rabbi by allowing individuals with needs of a rabbi to quickly create a FREE Rabbi.com account and post short answers to a questionnaire of their needs e.g. type of event, denomination/religion, ritual desire/not’s etc, of a rabbi to the site. Posted rabbi request jobs are then emailed (anonymously) to rabbis for review and consideration. Rabbi will then have the capability to submit their short responses for the rabbinic jobs that interest them. Those responses are emailed directly to the individual that posted the job for review and their choice of acceptance or rejection. This new method for hiring rabbi will result in rabbi coming to individuals, as opposed to individuals having to search out and contact a rabbi . This will make the rabbi hiring process less intimidating, more efficient and more rewarding. Rabbi.com also offers individuals the ability to search the Directory for a rabbi by denomination and geographical location. Rabbi.com takes this traditional search function further, providing additional search criteria ( reviews, etc.) and more specific search results. This feature alone will improve the current methods available for hiring a rabbi. A goal in creating Rabbi.com was to assist families in need of a rabbi through the often daunting process of finding a rabbi. Rabbi Talks, Rabbi Best Sermons, and more. In the past synagogues had served as an important role within Jewish society, today Synagogues are no longer connecting Jews with the community. With synagogue membership throughout the United States on the decline, many people have difficulty getting in touch with a Rabbi when they are needed. A central location for families to post ‘Rabbi Gig Requests’. Brides post what they want for destination weddings – multiple answering bio’s of rabbis to choose from. Families post what ritual desires (and nots) they want for Bar/Bat Mitzvah – multiple answering bio’s of rabbis to choose from. Before a child can have a bar or bat mitzvah inside bricks and mortar Synagogue sanctuary they most often require years of the family to pay membership dues as well as religious school attendance. DIY Bar mitzvah relieves the financial and time commitments synagogues place on both parents and students. Clergy will meet with your child (local/online) for the preparation of their Bar/Bat Mitzvah. We will train the children for Bar/Bat Mitzvah. Arrange for a real Sefer Torah for their B’nai Mitzvah. Taking the online route is especially good for today’s children, it is convent and flexible to the hectic schedule of today’s contemporary families. Tutoring via computer feels very natural after all adolescents can spend hours chatting with their friends online. No more working around a class or tutor’s schedule. Learn, study anywhere you have internet access. More fun than attending classes. Each of us has a spiritual goal. Come to Rabbi.com and refresh your soul.